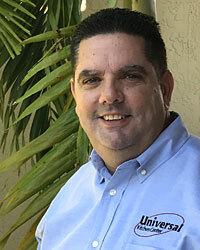 "Don't Call Another Kitchen Remodeling Company Until You Read This First..."
Hello, my name is Enrique Morales and I’m the owner of Universal Kitchen Center. First, I want to thank you for visiting my website, and secondly, I want you to know that I’m glad you’re here because I think I can help you. You see, I’ve been in the kitchen cabinet business for more than 30 years (32 to be exact,) helping homeowners just like you realize the kitchen of their dreams. The experience I've acquired in these 30+ years designing and installing affordable custom kitchen cabinets has earned us a reputation I'm proud of, but the true secret to our success is that we don't try to be everything to everyone. There are kitchen cabinet companies that will say yes to other projects like wood floors, crown moldings, baseboards and even stairs. At Universal Kitchen Center we solely focus on our core business which is kitchens, baths and closets because taking on every project under the sun makes you a jack of all trades but a master of none. With Universal Kitchen Center you have the peace of mind that your kitchen or bathroom remodeling project will be managed from design to installation by a specialist. If you're looking for a prefab kitchen or cookie cutter kitchen cabinets I can't help you. -- But if you're looking to design the custom kitchen of your dreams without breaking the bank, you're in the right place because that's what we do best for our clients - and we can do for you too. If you prefer cheaper mass-produced cabinets, you can easily buy one in any big box stores. Since they’re cheaper, these cabinets may not be as sturdy as custom built cabinets, and therefore do not last as long. In addition, they are limited in terms of design and craftsmanship, unlike our custom kitchen cabinets where the design is only limited by your imagination. Your 100% satisfaction guarantee is our priority. - At Universal Kitchen Center, that means that I will personally be the one who manages your remodeling project from start to finish. From the early planning, selection and design, to the installation, I will personally make sure every detail is meticulously covered to avoid unpleasant surprises, and if any issues were to arise during installation they are fixed promptly on-site. But that's not all... You'll also have the peace of mind knowing your new kitchen cabinets come with a limited Lifetime Warranty. You will not be rushed. - A kitchen remodeling project is a major home investment that will add beauty and value to your home or apartment for years to come. From start to finish, we will dedicate the time and patience required to see that the final outcome is the kitchen you envisioned - the kitchen of your dreams. You'll get the best deal. - The lowest price doesn't mean you're getting a good deal if the cabinet maker cut corners and you ended up with cheap materials and shoddy work. A long time ago I learned that people don't want the best price, they want the best deal. The reason I can give you the best deal on a beautiful quality custom designed kitchen is because I don't have the expensive big showroom overhead. When you hire me to redesign and remodel your kitchen, you're paying for my experience and expertise, not for the big expensive showroom because I come to you. Call me today at (305) 218-5108 to schedule an appointment for a Free Consultation, or click the button below to schedule it online. There's no cost or obligation so you have nothing to lose, because if I find that I can't help you, I will let you know right away and recommend other options. We'll take on your project only if it's a good fit. That's a promise! Thank you once again for taking the time to visit my website. I hope you found this information useful in your search for your dream kitchen.